There’s a race. And there’s death involved. In the then distant future, society is transfixed by a bloodsport, one that involves mowing down pedestrians in a cross-continental race. David Carridine, of the legendary familial acting dynasty, stars as Frankenstein, a popular and seemingly indestructible driver in Death Race 2000. He has to do battle with other drivers, and points are awarded according to cohort deaths: running over babies and the elderly garner the biggest scores. Cheery stuff! Actually, there’s a zany, over-the-top quality that was the hallmark of Paul Bartel films (he directs). 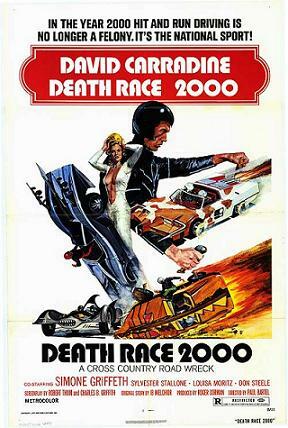 But there’s more to Death Race 2000 than your run-of-the-mill roadster movie. The film asks a lot of pertinent questions too. Look out for Sly Stallone as Machine Gun Joe and Mary Woronov as Calamity Jane Kelly. Gentlemen (and gentle-women), start your engines! And tune in for new episodes of the Really Awful Movies Podcast every Friday.